How agents and managers are on the take. What happened at Jerry Lee Lewis's post-performance birthday party in Memphis. Who was the power behind Mickey Gilley, Houston's real Urban Cowboy. Why Lou Rawls turned down more $20,000 dates than he accepted. Why Loretta Lynn fired her agent of fourteen years the week before Christmas and gave him only two weeks' pay. Why Billy Ray Cyrus went from $2,500 to $150,000 a night as the result of one hit song, "Achy Breaky Heart." What life is really like inside the ghetto world of reggae. Why James Brown is known as the biggest egomaniac on Earth. But Music City Babylon isn't only about big names and bigger egos. 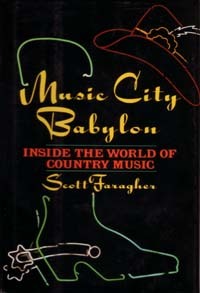 Faragher also reveals what actually happens to the wide-eyed innocent who brings a song, a guitar, and a dream to Nashville. Stardom, fame, and wealth are temptingly offered-for a price. Newcomers often learn the hard way that the "demo" record, the key to success, is a proposition that breaks hearts as well as pocketbooks. Music City Babylon is a revelation of arrogance, greed, and excess at all levels, from groupie to megastar. Scott Faragher was about to enter law school when he was offered a job with a talent agency in Nashville in 1973. He never looked back. Eventually he went on to form his own agency representing a broad spectrum of country talent.